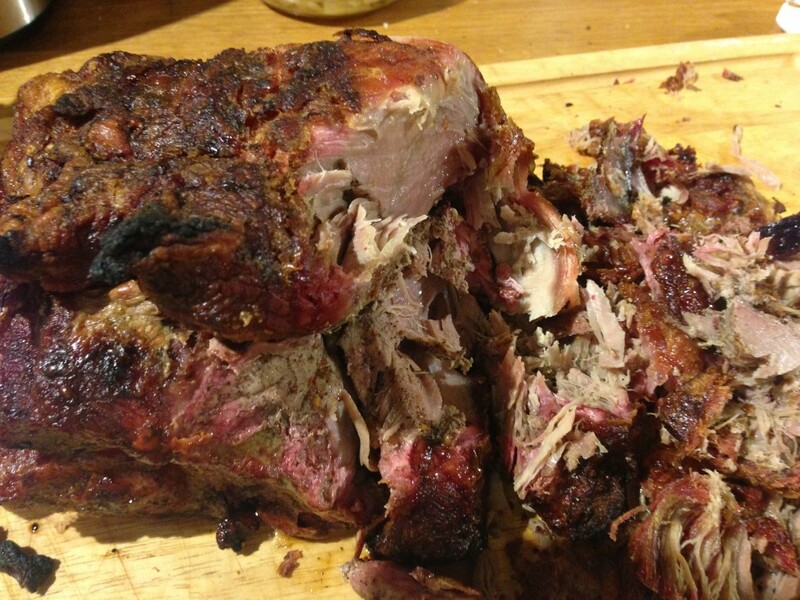 In my previous post, I mentioned that my first attempt at barbecuing a shoulder of pork was tasty enough, but not as tender as I would have liked. So, yesterday I tried again, this time cooking for longer. The results were much better. 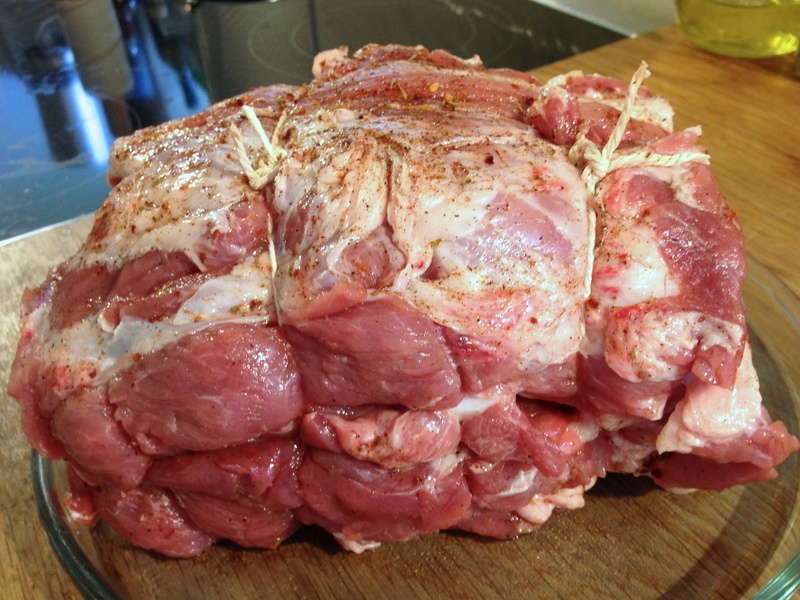 To start, I trimmed the rind and fat off the pork shoulder, rubbed it with spices, and then put it to one side for a couple of hours. Next, I lit the barbecue and cooked the pork with the lid on, for about three hours using indirect heat. Indirect heat means that the coals are gathered to the side of the barbecue, not directly under the meat – this allows for a slower, longer cooking time without burning the meat. My thermometer showed that the meat had hit the desired temperature (85˚C) after about two hours, but I left it in there for another hour just to be safe – I didn’t want tough meat again, I wanted this to be tender. Whilst the meat was cooking, I made a sauce. Different parts of the US have very different ideas as to what sort of sauces you should have with barbecued pork – I’m rather fond of the vinegary style that’s found in North Carolina. Mix all the ingredients together in a bowl. For the chilli sauce, simply use your favourite variety in whatever quantity suits your taste buds. I used a hefty dash of a piri-piri sauce that I happened to have to hand, which worked very well. Leave the sauce to one side for an hour or so. This sauce keeps very well in the fridge, so you can easily make extra if you like – just remember to give it a good stir before using it as the black pepper tends to sink to the bottom. With the sauce made, it was time to check on the meat again. It certainly looked done. I brought it inside and covered loosely with foil and left it to rest. After about fifteen minutes, it was time to eat. I took two forks and pulled gently on the meat. It shredded very easily – I’d say the timings this time were pretty much spot on. The outside was deliciously crisp, and the inner parts beautifully moist and tender. I served it with some potato salad and green beans, with the vinegar sauce poured over the meat. It was delicious. This is definitely something I’ll make more often. Copyright © 2018 David Wilkinson. All rights reserved.